It’s been a few days since I posted to my Picture of the Day section, so I figured now would be a good time to post one. 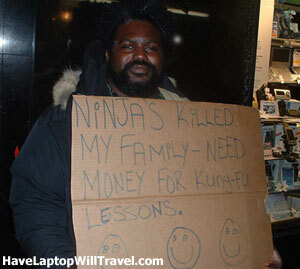 I’d give this guy money for Kung-Fu lessons. I mean common, his family was killed by Ninja’s and he sure doesn’t look like he knows Kung-Fu, so lessons would be in order. Did you catch it? FOOM! Muhahahaha!! !